We study how endemic, native and introduced arthropod species richness, abundance, diversity and community composition vary between four different habitat types (native forest, exotic forest of Cryptomeria japonica, semi-natural pasture and intensive pasture) and how arthropod richness and abundance change with increasing distance from the native forest in adjacent habitat types in Santa Maria Island, the Azores. Arthropods were sampled in four 150 m long transects in each habitat type. Arthropods were identified to species level and classified as Azorean endemic, single-island endemic (SIE), native, or introduced. The native forest had the highest values for species richness of Azorean endemics, SIEs and natives; and also had highest values of Azorean endemic diversity (Fisher’s alpha). In contrast, the intensive pasture had the lowest values for endemic and native species richness and diversity, but the highest values of total arthropod abundance and introduced species richness and diversity. Arthropod community composition was significantly different between the four habitat types. In the semi-natural pasture, the number of SIE species decreased with increasing distance from the native forest, and in the exotic forest the abundance of both Azorean endemics and SIEs decreased with increasing distance from the native forest. There is a gradient of decreasing arthropod richness and abundance from the native forest to the intensive pasture. 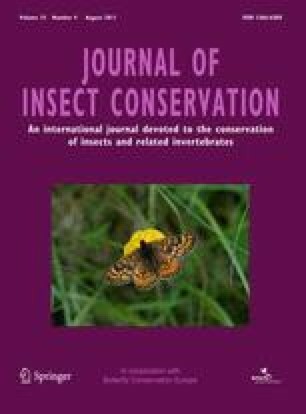 Although this study demonstrates the important role of the native forest in arthropod conservation in the Azores, it also shows that unmanaged exotic forests have provided alternative habitat suitable for some native species of forest specialist arthropods, particularly saproxylic beetles. We are very thankful for the support in the fieldwork by the Ecoteca of St. Maria and to the Serviços de Desenvolvimento Agrário de St. Maria. We thank Fernando Pereira and João Moniz for the help with setting up the traps and collecting of the insects, and Vasiliki Orfanou and João Moniz for helping with the sorting and identification of the arthropods. Enésima Mendonça is thanked for her help in preparing the map of Santa Maria, and Kostas Triantis for giving useful comments on the introduction. This study was supported by a Huygens Scholarship Programme (HSP) grant and a VSB Foundation grant to S. S. M. and financial support in the Azores was provided by project “Consequences of land-use change on Azorean fauna and flora—the 2010 Target” (Ref: Direcção Regional da Ciência e Tecnologia M.2.1.2/I/003/2008) to P. A. V. B.